"I will not be anxious..."
I have an almost 2 year old girl that is the definition of adorable! I love being her dad. I love that when I come home she drops everything and runs to me with both arms wide open. Now she’s yelling “Da-Da” as she runs toward me and it’s just icing on the cake. When I sit down and start to think of her future…man does my heart get heavy. I start thinking of future education, athletics, music, etc. What is she going to choose? Is she going to be a good student? She’s Asian so she has to learn the violin right? Oh and did I mention she’s adorable?! Which boys are gonna holla’ at her? Which is the best shotgun? Will she end up with someone who loves Jesus who loves and treats her well? Will she grow up loving Jesus? is calling me by name"
When my mind is filled with the roaring waves of fear and anxiety, I forget that God is in control. I have to stop and pray and repent of my misbelief. I remind myself that the God who crafted me and holds the heavens up with His hand is mighty and He alone saves. Try as I might, I could never control something as big as my daughters fate, nor can I bear that weight and pressure. The beautiful and reassuring thing is that God cares for my daughter more than I ever could. He beautifully crafted her into the adorable little being she is and continues to poor out love and grace. I know that because of Jesus. I know that because of what the Son of God did for us. Because of His perfectly lived out life, He was able to bear the weight of our sin to the cross so that we who have trusted and believed could have everlasting life. Through all of this He was in control. He has shown Himself to be loving, caring, kind, gracious, and merciful. Because Jesus rose from the dead, we are able to sing of this victory over sin and death. Yes, I remember calvary, when You took my place. I don’t have to be anxious. I don’t have to worry and fill my head with thoughts of what could be. I am not in control. I say that again. I am not in control. There is One who is in complete control, who loves and cares for my daughter way more than I ever well, and His name is Jesus. © 2017 Austin Stone Music (ASCAP). All rights reserved. Years ago I attended Weight Watchers for a few months in my hometown of Manassas, VA. Every Saturday I would show up at 10:00 a.m. for my weekly weigh-in and then listen to someone talk for twenty to thirty minutes about living a healthy lifestyle. On one occasion, as I was listening to the motivational speaker, I was distracted by a woman (customer) raising her voice to the manger in the back of the room where I was sitting. The woman was very upset to say the least. She told the manager, "I have been attending Weight Watchers for two months, and I have gained eight pounds! I want my money back!" The manager said something I have never forgotten. She said, "It is not what you do when you are here that causes you to lose weight; it's what you do when you are not here that causes you to lose weight." When she said that, I thought, "Boom!" The customer did not know what to say next. She just left. I have been a pastor for more than thirteen years. Every now and then someone says to me, "I have been attending church on Sundays, and I don't feel like I am growing in my relationship with God." When I hear that, I paraphrase what I heard from the manager of the Weight Watchers. I say, "It is not what you do when you are at church that matters most, it is what you do when you are not at church." Knowing Jesus Christ and living for Him happens best outside the walls of the church building. It happens in everyday life. It happens in our own Bible study time, our prayer time, in our homes, neighborhoods, offices, soccer fields, etc. How are you doing living out your faith outside the walls of your church building? As my former pastor, Lon Solomon, says, "Not a sermon, just a thought." Vintage, Week 4: What Are Baptism and Communion? This week Pastor Keith Watson gives our Vintage sermon summary. Why Is There a Different Preacher This Week? For those who may visit New City Church Macon or who may be new, what or who you see on Sunday mornings may seem a little... different. You aren't imagining things! What we do is different and yes there is a very good chance that the preaching pastor this week is different than last week! This past summer, 2013, an incredible thing happened - Macon Community Baptist Church merged with New City Church (Below is a video describing the merger). This merger was an answer to much prayer and has been an incredible blessing. The merger allows both congregations, as one, to better reach a very diverse city and to become a church that better represents the racial diversity of the city. More than that, the merger brought to New City a very able and gifted Pastor and Preacher - Pastor Lawrence Robinson (left in picture). 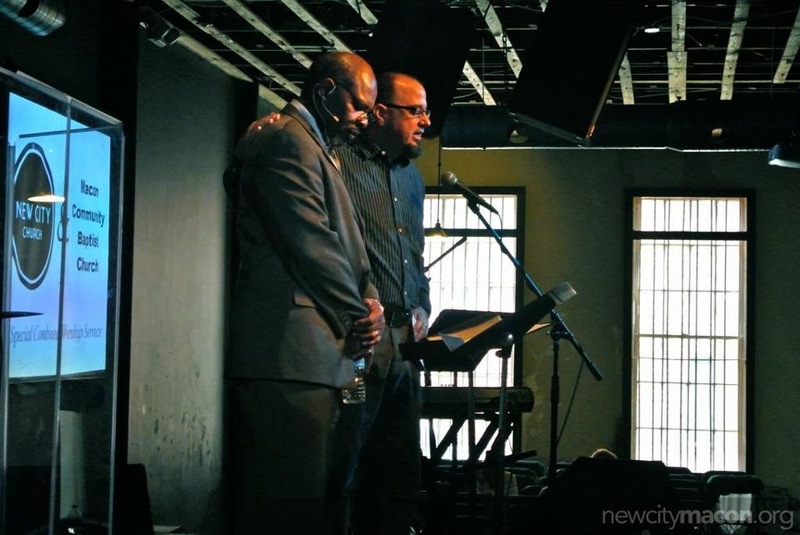 Having Pastor Lawrence as a member of the New City Elder Team allowed New City Church to quickly take steps toward launching a second Macon site in North Macon, something that we had been pursuing for a couple of years. North Macon is not a separate church... New City Macon is 1 Church, meeting in 2 locations. We share staff, we share resources, we share Missional Communities, we labor together to see the gospel transform ourselves, our church, our city, and the world. We also share preachers. Rather than having people choose which site they would attend and connect with based on who is preaching (some will like Pastor Lawrence's preaching better, others may like mine), we ask people to choose a location that meets their geographical needs as well as fits their missional context (who are the people in their sphere of influence and where are they more likely to attend?). Our primary preachers, myself and Pastor Lawrence will rotate between sites. For this month, January 2014, the rotation is weekly - one week I am in North Macon and the next week I am downtown. After January the rotation will become "random" - there will be no set pattern for who preaches where. We hope that this will encourage greater diversity at both sites and will help the people of New City better BE New City Church and follow Jesus rather than following a preacher. Vintage, Week 2: Who Leads the Church? Vintage: Week 1, What is a Christian Church?